Guided by the Key of Dreams, Sakura embarks on a new adventure! 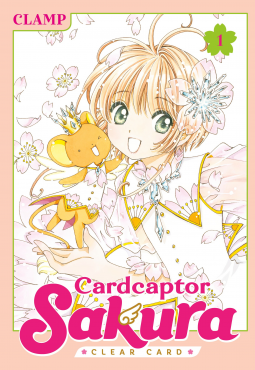 With over 15 million copies in print in Japan alone, plus translations in over a dozen languages, the original Cardcaptor Sakura is an international phenomenon you can’t miss! And now, the long-awaited new chapter begins! It is spring, with cherry trees in full blossom, and Sakura is just entering middle school. Her beloved Syaoran has returned from Hong Kong, and life couldn’t be better. But when she awakens from a strange dream to find her Sakura Cards powerless, how can she protect Tomoeda from disaster?! Free copy provided by Kodansha Comics for an honest review. I remember watching the American cut of this anime years ago then reading the manga at a later age and realising just how horrifically the anime had been cut for an english speaking audience. In 2016 CardCaptor Sakura returned to Japan with the Clear Card arc, and now it has reached the english speaking audience. Cardcaptor Sakura continues almost as if it had never ended in the first place. The characters are all slightly older but their key characteristics still endure Sakura is still shy but independent, Syaoran has returned from Hong Kong and Tomoyo is her lovable, video taking, clothes producing self. There is still the strong support network around Sakura who are all ready to support her as she requires. This initially re-introduction was pretty packed in with the reader skipping quickly over everyone, but once it is completed it is time to get into the meat of the story. This first volume introduces the reader to the latest cards, clear cards and the new mystery that is the lack of energy felt around them by everyone. As Sakura successfully captures a couple within the first volume the reader is sucked back into the world looking to carry on to the next volume instantly. Personally I believe that these clear cards will prove to be more powerful compared to their clow counterparts, but this is yet to be seen as the first volume really is just a reintroduction. I enjoyed coming back into Sakura’s world, it is a nice fluffy place compared to other iterations within this genre such as Madoka Magica which is aimed at a slightly more mature audience. I recommend that you return to this world if you have encountered Sakura’s story before and if not, catch up on the Clow Card arcs then carry onwards.